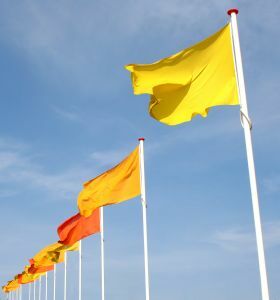 When a new dog moves into your home, it is not at all uncommon for him or her to feel the need to “raise the yellow flag” and claim their new territory as their own by marking it with some urine. Since many newly adopted dogs are already housebroken, this may just be a one-time occurrence. But what if your new dog continues to mark inside? How do you know if it is that they need to be housebroken, need re-training, if it is territorial, anxiety – or a combination of all the above? For many dogs, there’s a few simple “tricks” you can try to see if they can instantly put a stop that leg lifting or squatting. If they don’t, you can follow the steps we describe in housetraining your new dog. I’ve had many adopters tell me these tips work! Read on for four tips you can try to see if they stop your new dog’s marking inside your home. For the sake of clarity, I’ll refer to your new dog as a boy, since though girl dogs can be territorial markers, I’ve found that is more often the boys. 1. Spay or Neuter your dog. The surgery will eliminate hormonally-driven marking, but it does take time for hormone levels to subside enough to make a difference. If your dog was just fixed, treat them as you would an un-housebroken dog: crate or contain in your dog inside your home for the first two weeks, before letting them back to having access to the spots where they were marking, and follow the rest of steps for housetraining. 2. Vet check to rule out sickness. Bladder or urinary infections can be painful, and make a dog have to urinate urgently and frequently. Make a vet appointment ASAP to rule out this cause, and in the meantime you can try the tips below too. 3. Make sure he’s getting enough potty breaks. Even a dog that was fully housebroken in his prior home or foster home will need time to adjust to your schedule, and going to the bathroom on a new routine and in new places. Just like in housebreaking, make sure you are giving him as many potty breaks as you can in the beginning, on a schedule, and praising him when he goes outside. 4. If he is marking in just one spot repeatedly: Soak the area with pet urine enzyme cleaner and let it fully dry. (If it’s humid and its wall-to-wall carpet or upholstery, you can use a hair dryer to speed up the process after 1 day.) Do not allow him access to that area while it is drying. If there is removable carpet in that area (doormats are popular pee spots), put it outside. Put his dog crate or bed if washable (so where he’s been sleeping) on top of, or blocking as much of possible, the “marking spot”. Often that’s all it takes! Read a real-life story of this tip helping below. Some dogs will still raise the flag on their crate, but not their bed. If the bed or crate stops him, keep the bed and crate in that spot for at least two weeks. If the bed/crate doesn’t work, use his food and water bowls, and if that stops him, feed him there for two weeks. 6. If he only does it when you’re gone: Try a dog appeasing pheromone collar, diffuser or spray available from your veterinarian. 7. Belly bands: Smaller dogs can wear “belly bands” (kind of like a boy diaper) which protect your belongings indoors, and can also discourage the behavior and help with training as dogs are less likely to mark when they feel the wetness against them. Max’s adopter first wrote: “Everything is still going well with Max, overall, but we have a little bit of an issue with him peeing in the house. I’m not sure what to make of it, or how to stop it. Important to note: This behavior only started in the last week. The first week he was with us, he didn’t do it. He pees in my studio (where he sleeps at night, where he is fed, and where we enclose him sometimes during the day if we are out of the house) – in the same spot where my old dog had frequent accidents when she was sick. Obviously, he smells something, even though I thought all traces were gone. It’s a concrete floor. I caught him in action once, and said, “NO MAX!” and he stopped in the middle of it, and I got him outside, and he finished peeing out there. But, all the other times, it’s been a done deal, so I don’t know how to handle it with him. Sometimes during the day, when he’s downstairs with me, he will just trot into the studio and pee. And I might have had him outside just an hour before. Hello! So far, your tip is working! Max has not peed in the house since yesterday morning. I cleaned the floor, and put his bed on top of the “spot”… so far, so good. The pee issue has not resurfaced, since I put his bed in that area. Thanks for the great tip, Jennifer! Max is doing great! We have had no further incidence of peeing in the house. Max is just a great dog. We can’t believe our luck. We totally love him and are so happy to have him here with us.